We help private and public land owners to manage invasive tamarisk and restore wetland habitat. Tamarisk or salt cedar, Tamarix ramosissima, was introduced into the United States as an ornamental and stream bank stabilizing plant in the late 19th and early 20th centuries. Since that time the tamarisk tree has taken over and become the dominant plant in many of the riparian areas of the southwest deserts. Treated tamarisk in the foreground in contrast to standing tamarisk in the background. It thrives in moderately saline soils and, in contrast to most native plants, deals with salt by absorbing it and excreting it through the leaves rather than excluding it at the root surface, as do most plants. The result is that salt in the deeper soil horizons is brought to the surface and deposited in the duff under and around the plants, thereby excluding non-salt tolerant natives such as willow and cottonwoods. 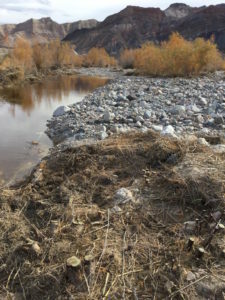 The Amargosa drainage has been heavily impacted by tamarisk over the years, much to the detriment of the native vegetation and the birds and animals it supported. Starting about ten years ago the Amargosa Conservancy, working with the BLM and the Nature Conservancy began a concerted effort to remove tamarisk along the Amargosa River, starting in Shoshone and working downstream, as well as at China Ranch. Initial work was done with California Youth Conservation Crews using chain saws and herbicide, but the bulk of the work around Shoshone was done by the Sweat Company using large excavators equipped with a grasping attachment which allowed for the tamarisk trees to be pulled out, roots and all. The trees so removed were chipped and left as mulch. Native vegetation is starting to make a comeback and we look forward to re-establishment of the original mesquite woodland along the Amargosa around Shoshone. The tamarisk at China Ranch has largely been eliminated with some ongoing cleanup. Work has also been done in the Amargosa Canyon and we look forward to making a real dent in that population in the next couple of years. The real beneficiaries of this work are birds such as the Least Bell’s Vireo and the Southwestern Willow Flycatcher, both of which are endangered species that prefer to nest in stands of native willow trees or mesquite.